A detailed description of how the weather stations were installed is available to assist administrators and staff with future installations. Thanks to teachers and administrators in School District 61 who kindly agreed to participate in a survey we sent out in May 2006, we are able to list some of the ways that the weather stations are being used in local classes and schools. 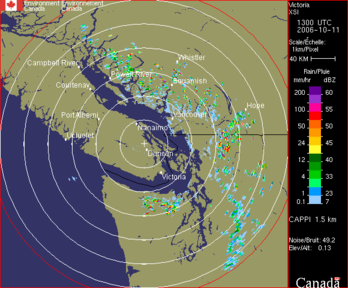 If you have some of your own ideas to share, please send them to weather at uvic dot ca. In addition, we have now developed some K-6 Science Teaching Tips and Mathematics Teaching Tips organized under the Prescribed Learning Outcomes for the new British Columbia K-6 Science and Mathematics Curricula. We have also taken apart a weather station to photograph the various instruments so as to provide a description as to how the weather station works. This gives students a close up of what is located on their school roof. The receiving unit (console) is typically located in the school library, computer room or main office. 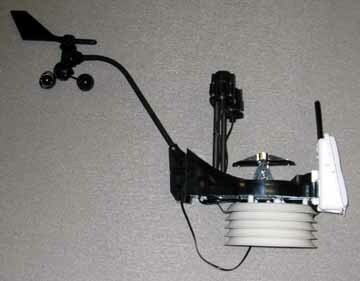 The picture to the right shows a simple summary of what you see on the face of the weather station console. A comprehensive manual on how to use the console displaying the weather data in your school is also available, although the quick reference guide adequately covers most frequently asked questions. Each weather station measures atmospheric temperature, atmospheric humidity, UV Index, incoming solar radiation (also termed insolation) wind speed, and wind direction. Atmospheric pressure is actually measured within the console and corrected to sea level. More details on each of these variables is given here. 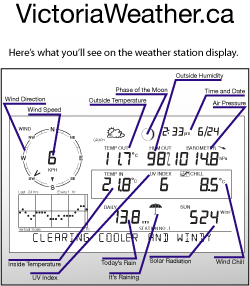 There are many activities that use the weather station data (see Lesson Plan section below). One example that uses the students&apos; observations and the Beaufort Scale is outline here. We have also started a collection of some interesting weather events that we have observed with the school-based micrometeorological weather station network. 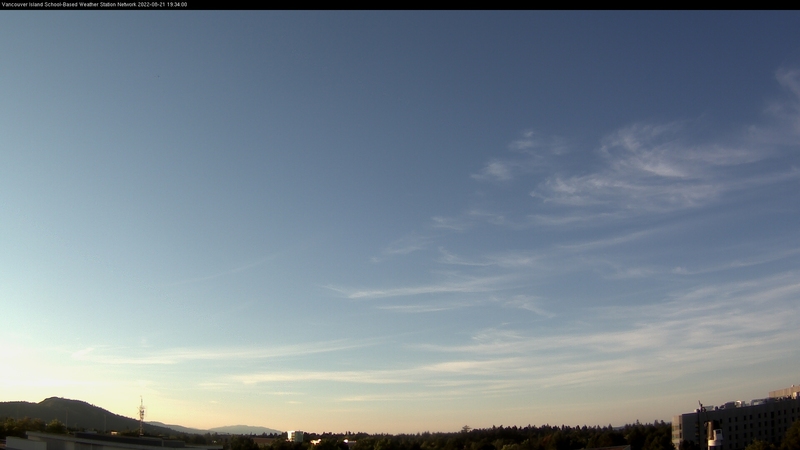 We have installed a camera on the roof of the Bob Wright Centre (Science Building) here at UVic and make movies of what it sees looking eastward. These movies are uploaded daily to Youtube. The images from the camera are also used to make daily keograms. We have provided links to various weather-related operational resources maintained by Environment Canada. These included radar imagery, satellite imagery, surface weather charts (operational analyses), marine forecasts and weather warnings. In addition, we have a link to map that shows current conditions across Canada in a form that is easier to interepret than the analysis charts. 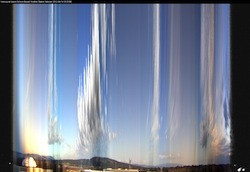 Photographs of different types of Clouds are also available. 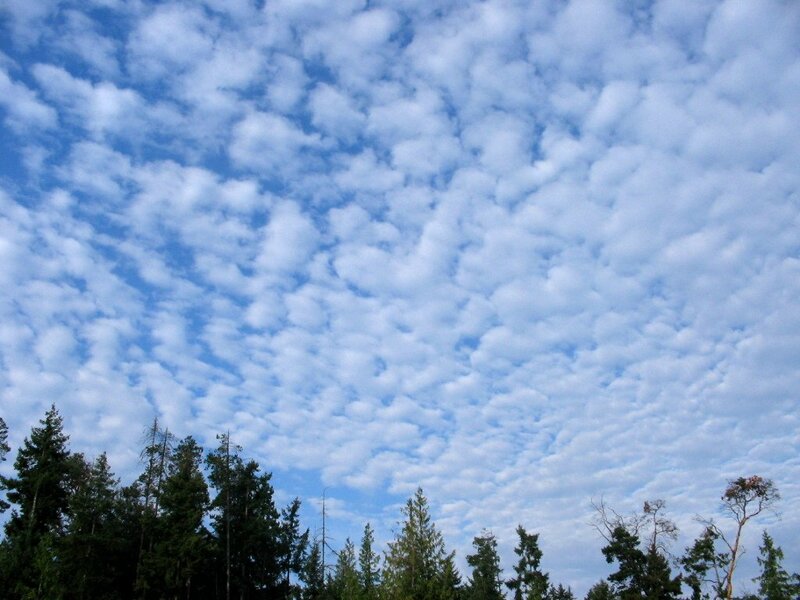 We also provide links to a few cloud-related external sites. Teachers in School Districts 61, 62, 63, 64, 68, 69, 70, 71, or 79 may wish to use some of the lessons plans that have been prepared to assist them in delivering their curriculum. There are two suites of lesson plans available. 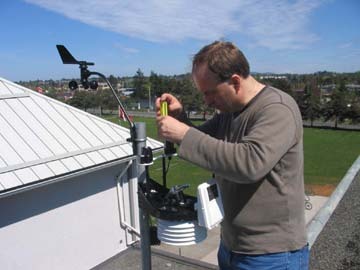 The first was written by J. Ramsden (Eagle View Elementary School) to assist teachers in School District 61 in using the weather stations that have recently been installed in their schools; and to provide a weather unit that incorporates the newly reorganized B. C. science curricula. It focuses on grade 4 science and math learning outcomes. These exclusive SD61, SD62, SD63, SD64, SD68, SD69, SD70, SD71, SD72, SD79, SD84 Teacher Resources, together with information on how to book a class visit or a demonstration weather station, are available on this site. 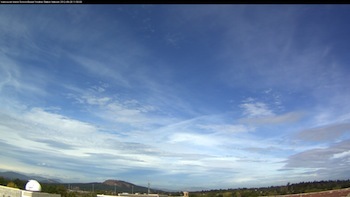 Please contact weather@uvic.ca for a username and password to access this page. This page took 23.6 milliseconds to generate.